Increase in preference for healthy meals and changing food habits. Furthermore, demand for convenience food and high nutrition content of oatmeal also boosts the market. Though, availability of substitute products such as quinoa, buckwheat, brown rice, and cornflakes are expected to hamper the growth of this market in the near future. 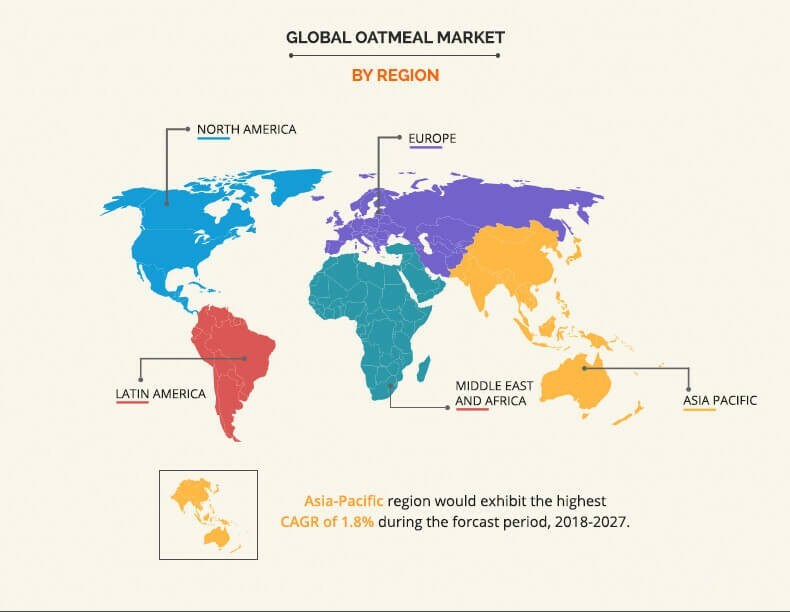 Development of different flavored oatmeal and the use of oatmeal in the cosmetics industry offer great growth opportunities for the oatmeal market. The oatmeal market is segmented based on type, distribution channel, and geography. 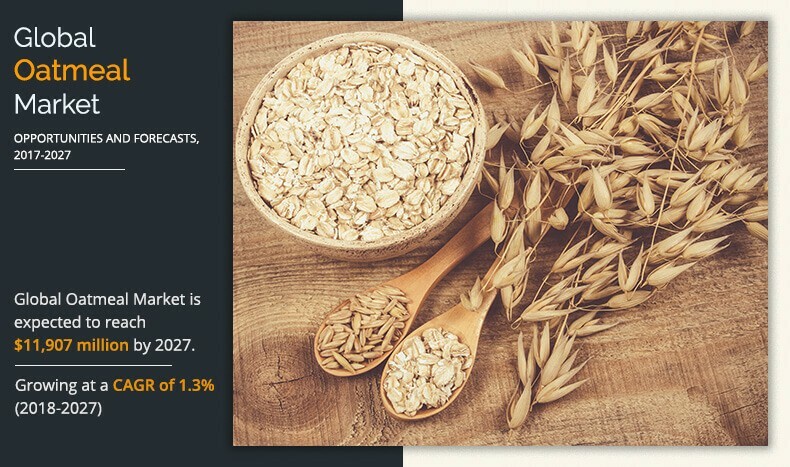 By type, the market is divided into whole oat groats, steel cut oats, scottish oats, regular rolled oats, quick rolled oats, instant oats and others. Based on distribution channel, the market is divided into hypermarket, supermarket, specialty retailers, convenience stores, independent retailers and others. By geography, it is analyzed across North America, Europe, Asia-Pacific, Latin America, Middle East & Africa and ROW. 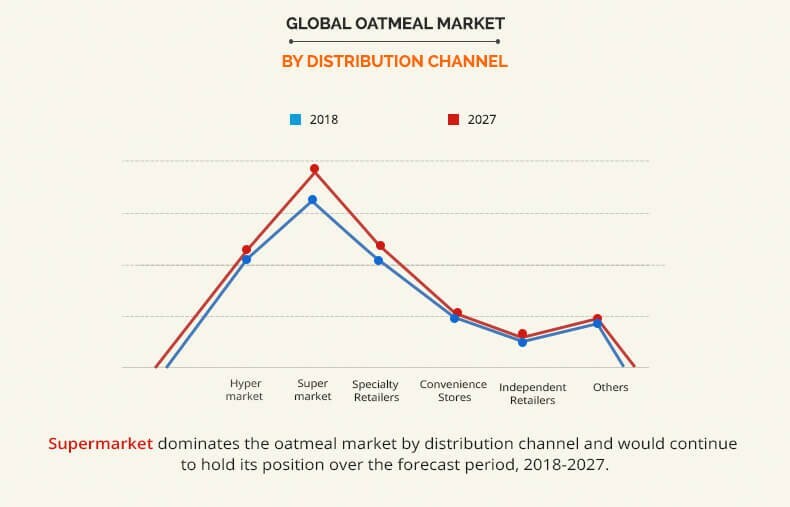 The key players operating in the oatmeal market are Quaker Oats Company, Nature's Path Foods, Inc., Nestlé S.A, Kellogg NA Co., General Mills, Inc., Hamlyn's Of Scotland, World Finer Foods, Weetabix Ltd., Cargill, Incorporated, and Bagrry's India Ltd. 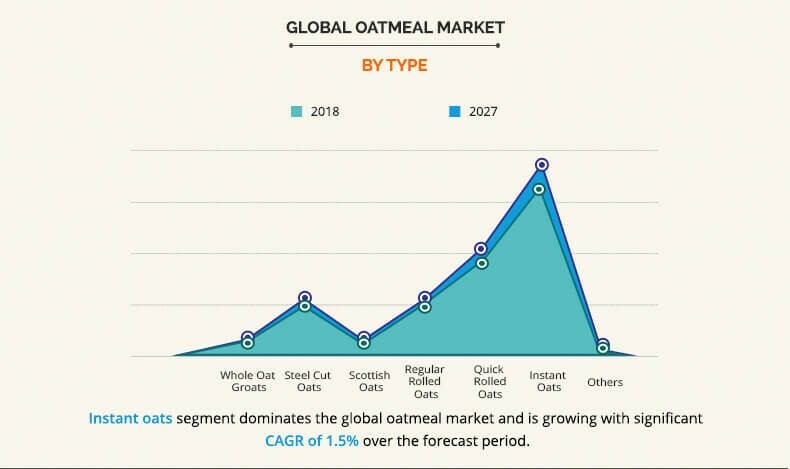 The instant oatmeal segment is estimated to be the most lucrative market in the global market due to high consumer preference, owing to its ease of cooking, availability of different flavor and a good source of vitamins & mineral. Supermarket by distribution channel dominates the oatmeal market. They have gained high preference among consumers as these stores offer considerable depth in the product portfolio by price range. In addition, high service quality and a sense of authenticity in products to shoppers enhances shopping experience of consumers. 7.6. Nature's Path Foods, Inc.
7.10. World Finer Foods inc.
Oatmeal is obtained from the oat grain, which is harvested from the seeds of the Avena grass. Rich in nutrients and dietary fiber, oatmeal is widely consumed as a breakfast cereal. Health concerns and focus of people on nutritious balance diet drives the consumption of oatmeal across the globe. The market share of instant oatmeal is high as compared to the rolled oatmeal as it requires less cooking time. New flavors in the instant oatmeal are introduced in the market that are tasty and also a ready-to-eat cereal for the people, whose lifestyle is hectic. This flavored instant oatmeal comes with organic dehydrated fruits and berry, which help enhance the nutritional value, as well as make an impact on the taste of the oatmeal. In addition, oatmeal is used in the production of cookies, energy bars, and desserts, as well. Health advantage of consuming oatmeal includes reduced blood pressure, reduced cardiovascular diseases, and lower blood cholesterol. It also lowers the chances of cancer as well as diabetes. Oatmeal is also used in skin care treatment due to its anti-inflammatory property. Growth of breakfast cereal market helps the oatmeal market to flourish in the emerging economies in Asia-Pacific, such as India and China, especially in the urban population. As well as, the use of oatmeal in cosmetics industry shows promising growth, which in turn helps in the growth of the oatmeal market.